The title for this site is taken from one of my more popular lectures at the University of North Dakota. Most of my students leave UND knowing my opinion about barter: it’s evil. Sure, barter works in a one-on-one exchange quite well. As an example, many people trade pizza or other goods and services for help moving. Both parties are typically happy with the exchange, but ask yourself the following question: would they be any less well off receiving cash? If they received cash and wanted to go out to the restaurant/bar and spend it on pizza or other goods they could. If they wanted to spend it on the iTunes store they could. If they wanted to buy more fascinating economics books they could. While I cannot guarantee that they would be any better off my larger point holds: the increased number of options they have as consumers implies they are no worse off with a monetary exchange than barter. Let’s consider some other costs or constraints imposed by a barter system. Barter relies on a double coincidence of wants. For an exchange to occur you must have the goods I want and I must have the goods you want. (We will relax this notion in a minute but we will see there are still issues.) If I have lemons and want apples, but the only person that wants lemons has wheat, well I am just out of luck. I am not going to trade with someone for a good I do not want. People tend to be picky about this kind of thing. People are also smart. They recognize this is a risk, that nobody will want to trade with them or they will not be interested in available trades. So if they really need a certain good to be available they will have to produce at least some of it themselves. Put another way, they will not specialize. When we move away from specialization we reduce economic growth and development from their potential levels. What about prices? In a barter economy we need a price for every good in terms of every other good. What does that mean? From my earlier example we would need a price of apples in terms of lemons. We do not have one standardized unit of account (that would be money! ), so we must keep track of many prices. If we have two goods we keep track of one price. I say one price because the price of apples in terms of lemons is one price, and the price of lemons in terms of apples is a separate price, but will only be the inverse of the apples-to-lemon price. So it is not a distinct price really. With three goods there will be three prices. So far not a great burden. There is no advantage to a money economy. At four goods we would need to track six prices and with five goods we would need to track ten prices. It starts to build. 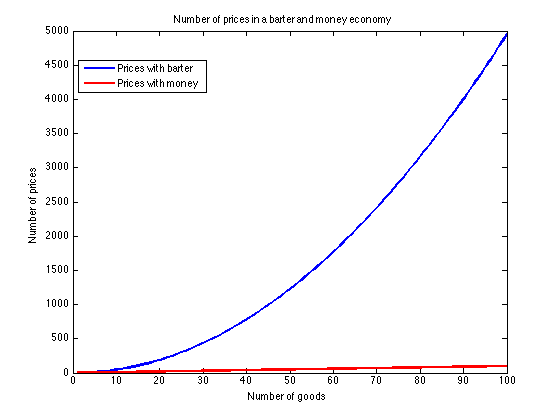 In fact the following graph displays the number of prices in a barter economy and a money economy for where there are between one and one hundred goods. There is a significant amount of extra time required to track and maintain prices for all these different goods. You need to be up to date on market trends from all over to make sure the prices you attach to goods are the same as the market prices in barter. Given that it will be difficult to track all this information you will likely make sure to produce some of all goods as a form of self-insurance. Once again you will not specialize and potential output is reduced. As mentioned before, people are clever. In a three good world, I may be willing to trade good A for good B, even if I do not want good B. For this to happen I need to know that the person with good C desires good B and not good A. In this way an exchange can happen even when the parties do not have a double coincidence of wants. However, in this case I must make two exchanges instead of one when only one exchange would be necessary in a money economy. Inefficiency reduces our output away from its maximum potential level. Bartering works against specialization and reduces economic output away from its potential maximums. It is a difficult situation to manage at small numbers of goods that quickly grows to completely unmanageable as the number of goods increases. The consumer societies of today would not likely exist if we had to continue to barter. J.K. Galbraith’s great example about the number of available brands and types of toothpaste would not be a problem in a barter economy. The inefficiency and increased transactions costs would likely lead us to far fewer types of toothpaste, if any more than just one. Students would likely all be one of a dozen children working on the family farm, not studying physics, chemistry, and other productive subjects. Would we have experienced the pace of innovation seen over the last several decades, if not centuries, if we continued under the shackles and constraints of a barter system? Unlikely.